The new Pulaski County station is the fifth one funded through local partnership agreements, the type of collaboration expected to increase as more sites are added. “The Kentucky Mesonet depends on partnerships to be successful. We have support at the federal, state and local level and that local level is really important because our stations in the network are community based,” said Foster. Another sponsorship agreement has been reached with the Fulton County Conservation District. That Mesonet station is located at Fulton County High School in Hickman, through a partnership that includes the Fulton County Board of Education. “That site at Hickman is a very important station for us because of its location in the extreme southwestern corner of Kentucky,” Foster said. "That station provides us with the first glimpse of weather coming into Kentucky from the west." He said the commitment of the Fulton County Conservation District has allowed Mesonet to make several upgrades at that station, including a new precipitation gauge and installation of soil temperature and soil moisture probes. In the most recent version of the state budget, Mesonet is fully funded at $750,000 a year. State lawmakers and the governor will continue to negotiate a final budget when the General Assembly goes back into session April 13 and 14. 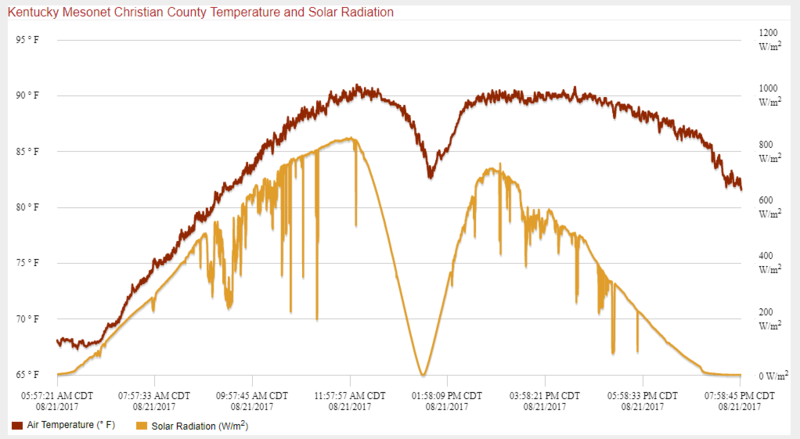 The Kentucky Mesonet dramatically increased data collection at its 68 weather and climate monitoring stations during the solar eclipse. Melissa Griffin is responsible for data quality for Kentucky Mesonet, which is based at Western Kentucky University. She says the data that came in during the eclipse provides almost a real-time collection of atmospheric conditions. 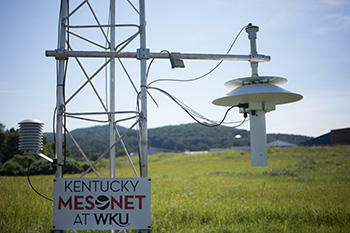 The statewide weather and climate monitoring network Kentucky Mesonet has installed its 69th station, which is in a high-risk area for tornadoes. The new Mesonet station is near Tompkinsville in Monroe County in south central Kentucky. Patrick Collins is the Mesonet systems meteorologist. He says the real-time data collected at the Monroe County site is important because the area, which is just a couple of miles from the Tennessee border, is prone to tornadoes.